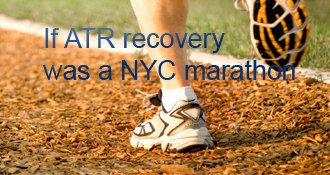 oldlady has completed the grueling 26.2 ATR miles to full recovery! Ok I have been in two shoes without a boot since 6 weeks. This last week I have been almost totally fwb. It’s only later in the day when the swelling is huge that I revert to both crutches. For my showers I use beach shoes and two days ago I found my old Teva sandles. Wow I forgot how comfy they feel on the arch and bottom of your feet. They really grab on the slippery shower floor and I really feel steady getting up from the shower seat and getting out of the shower. My question is should I stick to my sneakers(trainers) or are the teva’s safe enough to walk around the house? Does anyone else have any foot wear suggestions? Bare feet on the floor seems to hurt my feet. Probably irritates my plantar fas (sp?). My PT strongly suggested that I go to a store that specializes in running shoes - I didn’t want to spend the money, so I held off until I couldn’t stand the pain anymore. I was wearing a pair of Nike running shoes that I bought off of the shelf at a department store (the same ones that I was wearing when I ruptured my Achilles) and thought I was just fine, and that it was just expected that my feet would ache and my scar would rub on the back of my shoes. The guy at the shoe store watched my walk and how I was standing, then pulled out different running shoes for me to try. I chose a pair of Saucony Ride 5s (wide) that felt like heaven. What a HUGE difference!!! The support on the bottom of my foot is better, the backs are cut lower and the back is softer, wider and more flexible. Seriously, they are like walking on a cloud. People at work made so many comments the first time that I wore them about how my limp was practically gone. They really weren’t that much more expensive than my original shoes, and the place I went gave me a $20.00 physical therapy discount. I have never really thought about my feet, and have always just bought what was inexpensive and cute. But, it is worth it just to go somewhere that will listen to you and recommend shoes based on your needs. I can not believe how much better I feel. My footwear varied between 2 extremes. When I wanted support, I wore some high top hiking boots- very stable, some heel lift to assist with walking, easiest to walk without a limp, etc. They were my primary every-day shoe for several months. Then, there were times when I wanted to deliberately give my Achilles a workout: I used Sketcher Shape-Ups with a rockered sole. Wobbly, unsupportive, made me use all the muscles in my ankle, challenging to balance on. The one “easy” thing about the shape-ups is that they were very good for heel pain- since much more weight is carried through the center/arch of the foot. I sometimes wore my Vibram 5-fingers too; let me simulate being bare-foot, without scuffing up the bottom of my still tender foot. I’d be a little cautious about sandals, such as Teva’s. Seems like, while your gait is compromised, it might be easy to catch the flopping sole/toe on something, causing a trip/fall/stumble. I learned very quickly that they were a very poor choice while on crutches (5-fingers were best for that). Ryan you are right about the hiking boots. first thing in the morning I can wear my boots but after about two hours the swelling makes them uncomfortable. I feel very safe in them and the support is very good. I just can’t justify buying another larger pair. Joan I have an appointment with the footwear guy at the PT to discuss foot beds. My husband thinks they may run around 300 dollars- I can’t see putting out that much money for something that may not feel great. But I will have them let me try on some of their walking and running shoes. I spent two hours today in famous footwear and I could not find anything that fit comfortably. I’m with Joan. Buy yourself the best pair of running shoes that you can’t afford and your Achilles will reward you with miles of pain free walking/running. I bought a pair of Asics Gel Kayano’s and Superfeet insoles way back in week 8 and I wear them every day all day. I hear you Skutr, Lost my job because of this injury but I guess I will find other ways to cut cost and get some decent shoes. The PT footwear shop told me to hold off another two weeks while my PT works on the swelling. They sold me some super compression socks to help. Those things take about 15 minutes to get on. I’m sorry to hear that. I really couldn’t afford it either but I knew that in the long run (pun intended) dropping $275 on a pair of shoes, insoles & compression socks was going to pay for itself in a faster & stronger recovery. The trick to getting the socks on is to reach inside, grab the heel and turn them inside out leaving just the foot to squeeze into. After its on your foot just turn it right side out. Blessings & I’ll be praying for your healing. I’ve often been fussy about running shoes, but just because I know where I like the footbox to be roomy, and where I want my foot to be grabbed, held, supported, etc. When I went through a Cardio Rehab class recently, they recommended the kind of fancy-store analysis that Joan got, but I still haven’t done it. When my second ATR was healing and the bottom of my foot was very sensitive — e.g., it made me nervous to walk barefoot, because if I stepped on a telephone cord it felt like a bed of nails — I got a pair of (imitation) Crocs that felt like heaven. Soon it’ll be 2 years I’ve been in the Crocs, indoors only. I’ve been wearing no back slip ons by Merrell and Crocs the last few days. The more I walk, the more all my running shoes irritate my AT. I have a lump in the AT where the heel backs rub and stick into it when I PF. I bought a new pair of lightweight, flexible Adidas Climate Cools yesterday, but even the low heel backing in that shoe irritates my AT. The only thing that works are my Skechers “Go Runs” with a really low heel but they have a positive DF producing footbed which is worrisome. So for now - I’m sticking to backless except during exercise. It’s so funny because we are definitely on the same path. I’ve finally started standing on two legs (shh.. don’t tell my doctor) and playing with testing it out…. and it feels like walking is just around the corner, too! Only one PT session under my belt but looking forward to the electo stimulation/massage stuff that everyone’s talking about…. awesome job on the speedy recovery! Wow- OldLady! Just stopped by to catch up on things and you are from Rhode Island??? I grew up in N Smithfield! It truly is a small world! I used to dream about running and I would wake up and say to myself, “Wow that felt really good.”. Enjoy the dreams because they will come true soon. I promise. Hang in there oldlady!! It gets better, and quite rapidly! old lady - I completely relate! My cast came off at 6 weeks and I was ready for the boot Asked the doc some questions about it and he responded like your doc- no boot so that I could get better ROM quicker. he was surprised I didn’t bring 2 shoes to the appointment; I was surprised I wasn’t getting a boot! That walk from the table to the front desk/reception area was possibly the slowest, longest walk of my life!! My follow-up is a lot sooner. He said in 2 weeks (nwb during those 2 weeks) so next week I’ll see what awaits.. How are you doing one week later? Maybe I’ve missed it but how come you are at 11 weeks since ATR, but only 6 weeks since treatment began? Sorry if you’ve already explained. As for your doctor, his prejudice against ‘the boot’ and his apparent ignorance of how the rehab should work, is extreme and surely deserves to be questioned. Maybe he’s a genius in disguise, about to release the latest ‘best practice’ recovery protocol. Will be interesting to get your PT’s views - some PTs seem to be more pragmatic and up-to-date than their often brusque colleagues. The medics should be seeking to minimise risk at the same time providing their customers, the patients, with a high quality, sustainable repair over an appropriate time period - and much has been written here about that, and boots too of course. We may not be medics, but we are not ignorant. Rant over. I was going to stop responding altogether but then I went and read your blog! You’ll be fine of course - just take care. Thanks for the advice Sheena! Norm I guess I was so upset I did not explain very well. At the office they removed my cast (had it on for four weeks) and then the doctor sent me on my way saying a boot would make my foot useless because I would never get any range of motion. Hence the crack that I would end up with a useless “club foot” I gave him the info on the vaco boot having rom and a so forth and he was totally against a boot of any kind he said. I’m missing something. He can’t have casted you, or you couldn’t get PT. So he left you in 2 shoes? That’s quick at <6 weeks, but not unheard-of. Are you PWB moving toward FWB “as tolerated”? Obviously, Watch Your Step, because you’re as vulnerable as you probably feel. I didn’t have the op so I can’t really compare our ATR’s but that does sound scary. Lots of people wear hiking boots when they come out of the boot and go into shoes. I would wear something like that. Not great weather for a hiking boot but it’s not great wearing an aircast boot either. I take my boot off as much as I can at the moment with this glorious weather. Hi! I look forward to the day I hit the beach too! Since I am still healing my open wound I can not endure going to the beach and not being able to get in the water or being able to surf. So summer had brought other activities my way. patiently waitng a beach day! I’ve been in a boot for the past 4 weeks, since coming out of a cast. Just for the record, it’s an “Anklzer ii” by Bird & Cronin. You can google it, if you want to visualize the beast. For the first 3 weeks that I was in it, I was fully NWB, but allowed to ‘balance’ on it. For the past week, I’ve been FWB, which is such a relief ! Here’s a bit of what I’ve discovered about ‘the boot’ along the way, in case you’re interested, or you find it useful. I wasn’t given any advice on fitting/comfort etc, I was simply told to get on with it, and to keep it on 24×7…..
Hi Oldlady, my response was meant for you, as well as Curlygirl Enjoy walking on the beach in your boots! I would give yourself a few weeks to get comfortable walking with a normal gait FWB in the boot before you try walking with the boot in sand. My boot protected me very well at weeks 10-12 walking on really uneven, cobblestoned streets during a 2 week vacation in Spain. I even ventured out in the sand a few times in bare feet without the boot - walking very slow and being very careful of course! Not recommending that for anyone else due to the risks, but it sure felt good! Getting out of the cast has to be the best milestone to reach on our rehabs! Enjoy! Hi, I also live by the beach but on the West coast. I have been down to the beach but stayed on the boardwalk. I still have steristrips on my wound and I was fearful of getting sand in my boot that would really rub and make me sore. I only have the basic air cast but I feel secure in it and I do not feel I could step and tear the AT. So I think you could do it. Enjoy! Congratulations! It is so important to celebrate these milestones. My wife and I always did something fun each time I reached one. I’m on the east coast of US. Your right ,Tiverton can be found in Ontario, UK and here in Rhode Island. I work at a ski resort and it’s great watching our guest eyes light up when they think I am from or live near their home. I think I will make that one of the things I can plan on visiting after this ATR phase of my life. I know there’s a Tiverton in Ontario, and probably one in UK. Maybe the US, too. So where ARE you, OL? Do you mean me or old lady? I am from London living now in San Diego and I believe old lady is from the US. are you in the UK or the US? I have been in my boot for 4 days partial weight bearing and had my first PT this morning. The massage they gave my leg was heavenly.I have home exercises to do as well. keep us posted on your progress. oldlady’s AchillesBlog is proudly powered by WordPress and WPDesigner..